I spotted this Massini display at Meijer this morning and although there are some re-promotes, three shades looked new and different to me. Sorry for the poor cell phone photo! There are nine shades in the Cozy Up To Color Holiday 2010 Collection, and I picked up the three that looked new. I also picked up the one that appears to be a dupe of Massini Slammin' Red (Rudolf), thinking it may be just a little different or have a smoother formula. Above: Tinsel Time looks unlike any other gold I've seen. The glitter is very fine and although it may work well alone, I think it would be a great top coat color. Below: Oh Joy! 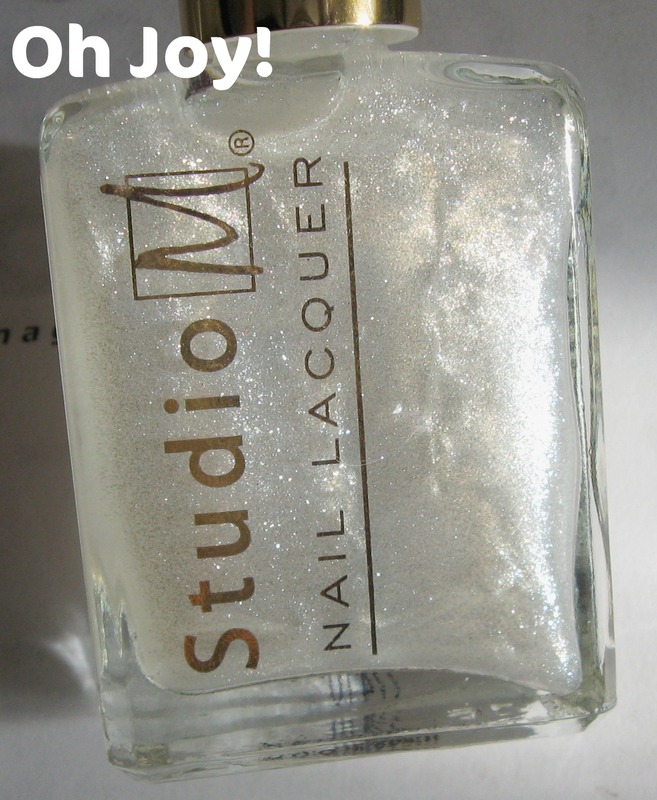 is a white shade that appears to have a similar finish to Tinsel Time. It reminds me of Orly Winter Wonderland, only with much finer glitter. 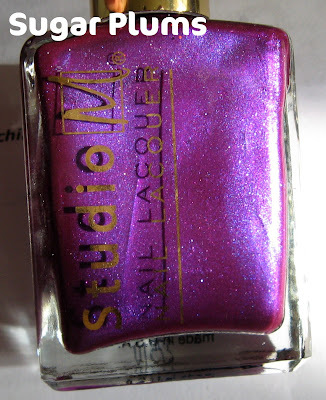 Below: Sugar Plums is a rich violet shimmer shade that has multi colored micro glitter. Not terribly unique, but I'm always drawn to this shade. 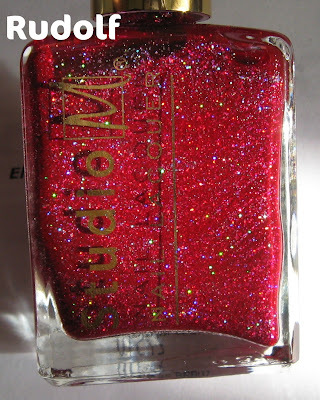 Below: Rudolf is a dupe to Massini Slammin' Red, but when I held the two side by side in the store, the glitter in Rudolf looks ever so slightly different. I'll have to do a comparison, because they're very close, but another Slammin' Red isn't a bad thing! I'm taking a quick break between wrapping presents (which I hate doing! ), and painting the bathroom (yep, hate painting too! ), so I'm hoping to swatch these later on today. That gold is really lovely. Your going to be exhausted! I love Massini polishes!! Sometimes I wish I lived in the US, haha. rudolf and oh joy are my favorites! Agh, I wish I had access to Massini! Rudolf looks awesome, maybe a Slamming Red with better formula? A girl can hope, right? Rudolph is really pretty! 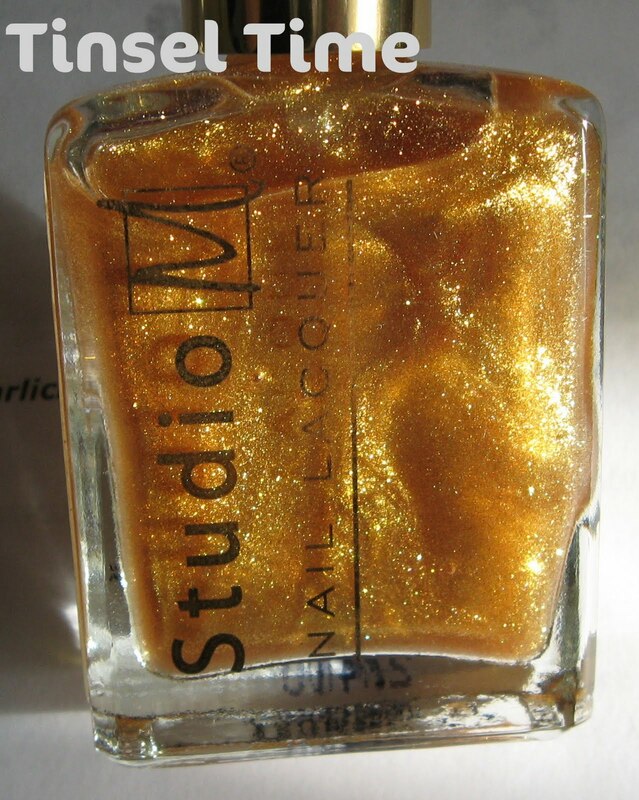 I just picked up a couple of these yesterday (Studio M, not from this collection)--my first of these polishes. Ooh I can't WAIT to see swatches of them, especially the gold, looks amazing!